Enriching lives through expert and compassionate care. JourneyCare's Vision: Transforming lives by building a community where exceptional palliative, supportive and end - of- life care is accepted, expected and available to all. Transforming lives by building a community where exceptional palliative, supportive and end-of-life care is accepted, expected and available to all. We provide pain and symptom management and end-of-life expertise to residents of a 10-county service area in northern Illinois. Offering both in-home care and five Hospice CareCenters, we are known for our broad continuum of care and innovative programming. Beyond traditional services and a comprehensive bereavement program, we have the largest pediatric hospice and palliative care program in Illinois and we embrace non-traditional therapies as well as open access for patients receiving aggressive treatment. Our mission is achieved by a team of board-certified physicians and highly-skilled nurses, therapists, counselors, social workers, chaplains, and volunteers. JourneyCare has never turned anyone away due to inability to pay because our promise is to meet the patient where they are, build trust, and share the journey, regardless of reimbursement rates. We seek to put the patient in control of their care--because it's the patient's experience and the family's memory. We are here to help when patients and families need it most. We begin by listening and answering the questions of those who come to us. We know that each experience is personal--and so is our care. We offer the physical, emotional, and spiritual support that's needed to welcome each new day. JourneyCare accepts donations. Donate Now. I've been working with JourneyCare for approximately five months now and recommend it to anybody with an interest in volunteering with hospice. The training is rigorous and important to help volunteers feel comfortable when they approach their assignments. Volunteer coordinators are responsive and appear to take great care in matching volunteers with patients so that everybody has a positive experience. During these five months, I have had opportunities to speak with those who have had need of JourneyCare's services. These patient families have all spoken very highly of their experience -- and that has been before they knew that I volunteer with JourneyCare. I have been volunteering with Journey Care for about a month and have been very pleased with my experience. All the staff I have worked with have been very helpful and friendly. The orientation and training were very thorough and informative. I am able to schedule my patient visits when it is convenient for the both of us. Lastly, the patient I have been paired with for visits is very sweet and I feel very fortunate to be able to spend time with him. 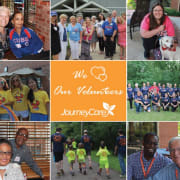 Journeycare is an amazing place to volunteer. They are very family orientated. They want the families and patients to feel like they are at home and taken care of. I look forward to every experience I have there. I'm a hairdresser, currently in nursing school. So I have the pleasure to be able to still do my passion, hair. As well as meet wonderful people along the way. I have been volunteering with JourneyCare for a few months now, and have been very impressed with the staff, the volunteer program, and the overall comprehensiveness of JourneyCare as an organization. From the start, I found the volunteer coordinators to be highly responsive, friendly and very helpful. I was looking for an opportunity that offered 1:1 contact with patients and their families but that also offered flexibility with my own irregular schedule. So far, I have enjoyed volunteering in-home, mostly with pediatric patient/family members. I think what is so unique about this volunteer program is that there are so many different opportunities to help based on your personal skills and interests, and you pick what you are comfortable with, whether that is directly in the patient's home, in a facility with the support of staff onsite, or assisting with various projects, functions or administrative roles. Volunteer activities at the Journeycare IPU in Woodstock gives one an opportunity to work with skilled professionals and other volunteers with similar interests. The IPU staff and IPU procedures offer the volunteer structure and support, allowing those who serve as volunteers a comfortable environment to meet with patients and their family members. Volunteers are welcomed as part of the care delivery team and their unique talents and deepest concerns are respected and supported. As a volunteer, one also has the opportunity to work within a multidisciplinary environment, which offers opportunities to gain valuable perspectives from regular contacts with medical professionals, clinical support staff, social workers, and chaplains. There is hardly a day where I do not feel I have grown through my work and made a contribution to the patients and families we serve.